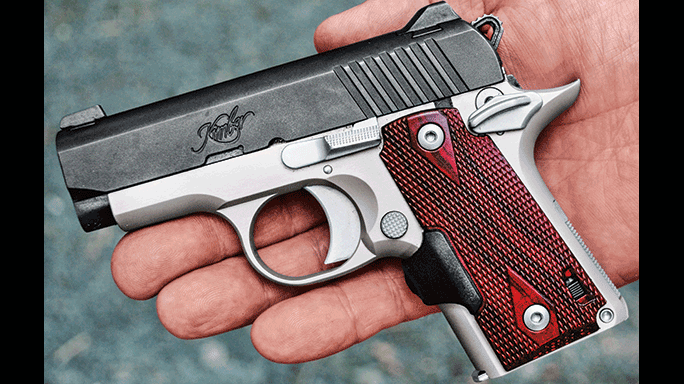 Kimber’s Micro Crimson Carry .380 ACP boasts mild recoil, Crimson Trace Lasergrips and more. The little .380’s recoil was very controllable, especially when using Kimber’s optional extended magazine. The attractive Crimson Micro Carry comes with a matte black steel slide, a satin silver aluminum frame, a solid trigger with a serrated face and double-diamond-checkered rosewood Crimson Trace Lasergrips. 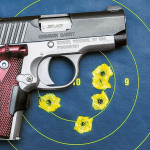 This target shows the Micro Crimson Carry’s average accuracy at 7 yards using just the pistol’s fixed, low-profile sights. The Micro Crimson Carry is a miniature 1911 in .380 ACP with a Crimson Trace laser that turns on when you firmly grip the gun. 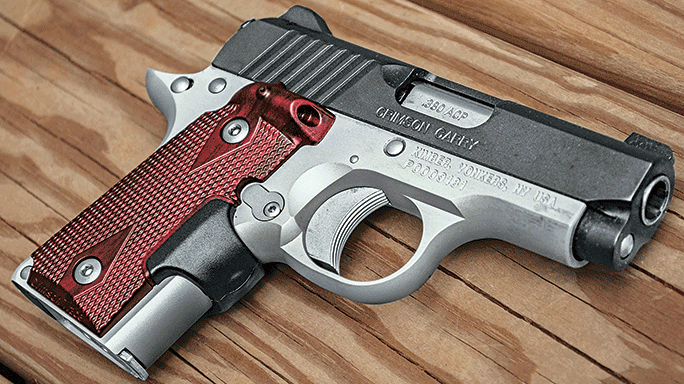 Kimber expertly bevels the Micro Crimson Carry’s magazine well for smooth, fumble-free reloads. The on/off switch for the laser is located at the bottom of the left grip panel. 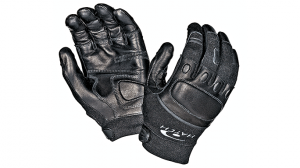 Also note the left-side-mounted thumb safety. 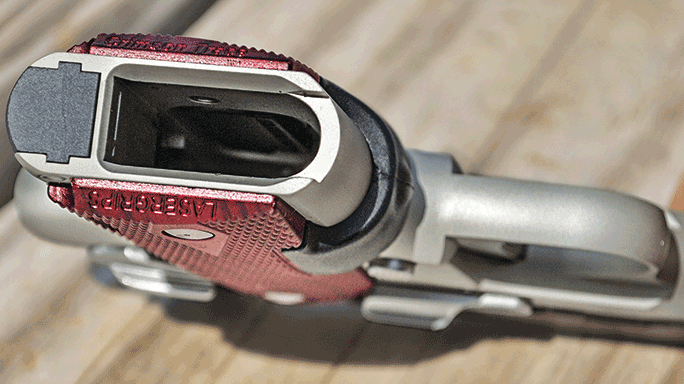 The Crimson Trace Lasergrips project a bright red dot on the target, even in bright daylight. Firing off-hand at 7 yards, the Micro Crimson Carry shot very respectable groups. 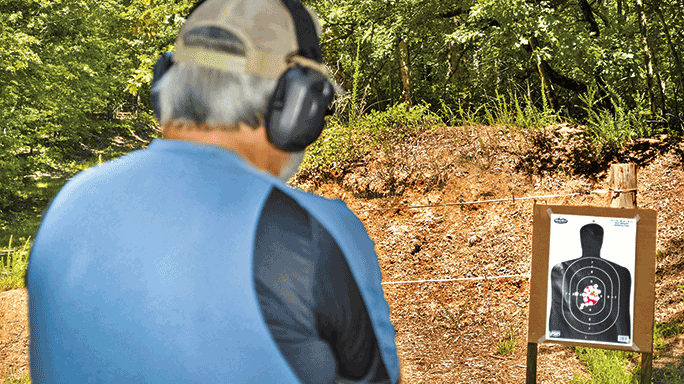 If you’ve been to a gun show recently, you might’ve noticed two trends in handguns: an increasing number of pistols chambered for the .380 ACP cartridge and an increasing number with integral laser sights. And the pistol that I found so interesting not only combined both of these features, but also aped the appearance and handling of the Model 1911. I mean, what more could you ask for in a pocket pistol? The cartridge under discussion here first saw the light of day in 1908 as the 9mm Browning Court (Short). Also known as the 9mm Kurz, 9mm Corto and 9x17mm, it was used as a service cartridge by the Italian, German, Hungarian, Austrian, Spanish, Dutch, Yugoslavian, Turkish and Czechoslovakian—to name but a few—police and armies up until the 1960s. On this side of the Big Pond, several manufacturers offered pistols in the same caliber but, bowing to Americans’ innate dislike of the metric system, the cartridge was rechristened the .380 ACP. The original load consisted of a straight-walled, rimless case 17mm in length and topped with an FMJ bullet weighing between 85 and 95 grains and traveling at approximately 900 to 1,000 fps. While our European brethren considered such a round suitable for military and police service, in the U.S. it has generally been regarded as a low-end defensive cartridge. 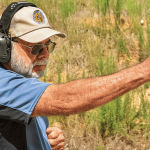 But in the past few years three trends have caused a dramatic increase of interest in .380 ACP pistols: materials, ballistics and concealed carry. In the past, quality .380 ACP pistols (e.g., Colt Model 1908, Walther PP/PPK) were made of 100-percent steel and accordingly were quite heavy. The use of polymer and alloy frames in this class of pistols has lightened them significantly, making them much easier to carry all day. Improved propellants and high-tech JHP bullets have dramatically improved the effectiveness of the .380 ACP cartridge, making it a much more practical choice for defensive purposes without any real increase in recoil or muzzle blast. Finally, as more and more states have adopted “shall issue” CCW laws, the demand for small, lightweight handguns has skyrocketed. Kimber has long been a major player in the 1911 pistol market, and the company’s pistols have proven popular with military and police agencies, such as MARSOC Marines and LAPD SWAT, competitive shooters like those on the USA Shooting Team, and civilian gun owners. 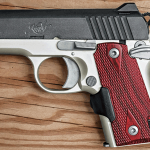 While Kimber offers compact and full-sized 1911 pistols, the burgeoning CCW market led the company to introduce its subcompact Solo series of 9mm pistols, which differed a bit from the 1911 genre. 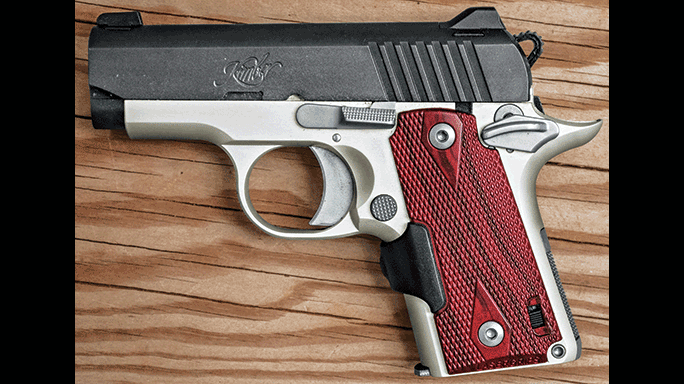 Then, in 2013, seeing the growth of demand for .380 ACP self-loaders, Kimber unveiled its Micro series of pistols. 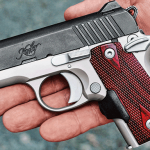 With the Micro series, Kimber has returned to its roots, because these little .380s are little more than miniature 1911s. The Micro series has grown over the past two years and now includes a dozen models that are mechanically identical but feature different finishes, grips and sights. The one I received for testing is the Micro Crimson Carry, or MCC. The MCC’s slide is machined from solid steel with a blade front sight and a low-mount rear sight, both of which are mounted in dovetail cuts. Also note that the sights are machined from steel, not plastic. As befits any “customized” 1911 pistol, the ejection port has been lowered and flared to ensure reliable ejection of spent cases, while square-cut grasping grooves allow the shooter to retract the slide securely for loading the pistol or clearing a malfunction. 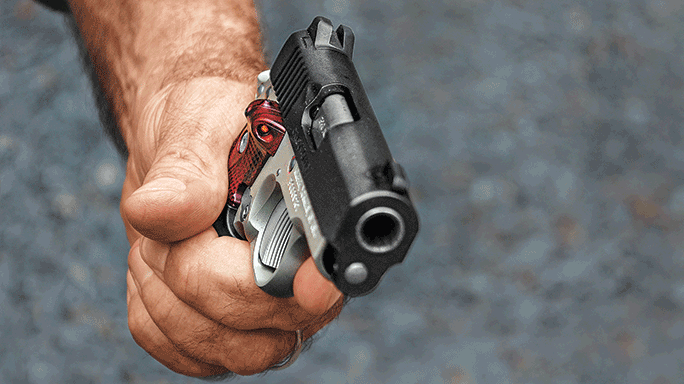 Unlike many .380 ACP pistols, the MCC is a locked-breech design. A single lug on top of the stainless steel barrel mates with a mortise inside the slide to lock the two units together, a la the 1911. When the pistol is fired, the slide unit recoils for a short distance whereupon an angled lug on the bottom of the barrel articulates on the slide stop shaft, pulling the barrel down and unlocking it from the slide. The slide continues to the rear, extracting and ejecting the spent case, and is then pulled forward by the recoil spring, picking up the next round from the magazine and chambering it as it goes into battery. The pistol features a full-length recoil spring guide rod for reliable operation and consistent lockup. The pistol’s lightweight aluminum frame reinforces its 1911 bona fides. The thumb safety, slide stop lever and magazine release are all located in the proper positions and operate as expected. There is no grip safety, but a generously sized grip tang positions the pistol securely in the hand and helps dissipate recoil. 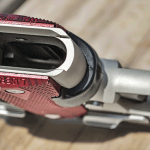 Besides the thumb safety, a disconnector prevents firing unless the slide is completely in battery while a firing pin block safety can only be deactivated by a full trigger stroke. The beveled magazine well allows you to perform reloads with the six-round, single-stack magazine quickly and positively. 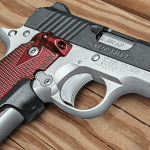 Kimber also offers an extended seven-round magazine with a polymer basepad that provides a full, three-finger grip on the pistol, further improving recoil control. The first laser sights meant for mounting on handguns hit the market in the late 20th century. In general, they were large, cumbersome and some were not overly reliable. But with the rapid advances in laser technology, it wasn’t long before small, light and utterly reliable handgun lasers were available. Which is where the MCC earns the “Crimson” part of its moniker, as it comes standard with a set of nicely checkered rosewood Crimson Trace Lasergrips. The right grip panel features an integral laser sight while the power switch is located at the bottom of the left panel. Both grip panels hold batteries for the laser. Finger pressure on the rubber-encased activation pad on the frontstrap activates the laser. 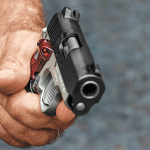 Mounting a laser sight on a handgun used for defensive purposes provides a number of benefits. First of all, a laser helps you get on target quickly, especially in low-light conditions. You can accurately fire the pistol without having to bring it up to eye level, which could be very useful if you’re in an awkward position or must fire one-handed. The laser also allows the shooter to engage targets from behind cover without exposing too much of themselves to their opponent. Finally, “painting” an opponent with the laser has been known to have a mollifying effect on the situation. I found my test MCC to be a finely made little pistol. The tolerances were tight and the high quality of the materials, fit and finish were all evident. But it’s a Kimber, so what did you expect? The single-action trigger broke crisply with a bit less than 7 pounds of pressure, and the iron sights were large and easy to acquire. The controls were all in the proper 1911 positions and easy to manipulate. 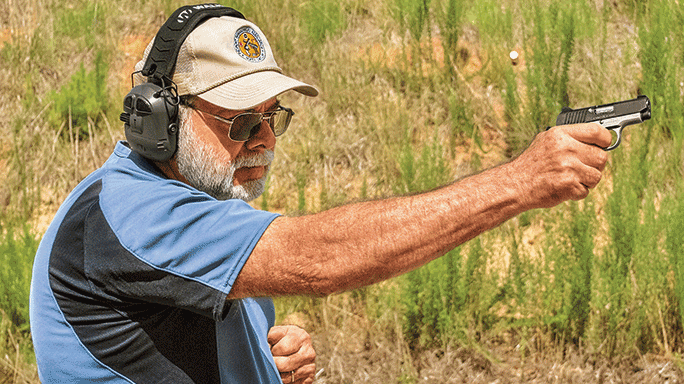 To see what type of accuracy I could wring out of the MCC, I fired a series of five-shot groups from 7 yards with three brands of quality .380 ACP ammunition. 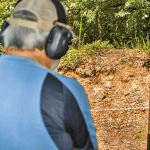 While firing a pistol of this size across a rest is not an easy task, the iron sights were well regulated, allowing me to produce nine well-centered groups, several of which I believe were very impressive for a pistol of this class. Considering the MMC’s task in life as a close-range defensive handgun, I set a combat target out at the “pocket pistol” distance of 5 yards, switched on the Crimson Trace laser and proceeded to see how the Kimber performed when fired from chest and waist levels. It quickly became obvious that I could not get the little red laser dot to stop bouncing around completely, but once I had the hang of it, I was quickly putting rounds on target with regularity. Most of these rounds impacted inside the target’s X ring. Early in my test firing I experienced a few failures to eject. Upon close examination of the pistol each time, I discovered that the slide stop lever had backed out of the frame slightly. Pushing it back in with my thumb let me keep shooting. On a more positive note, the checkered Crimson Trace Lasergrips and checkered mainspring housing allowed a very secure purchase on the pistol, which greatly aided in the recoil-control department, something that cannot always be said of handguns of this class. Except for that one problem, which seemed to resolve itself after I had run about 40 rounds through the pistol, the Kimber Micro Crimson Carry performed admirably. 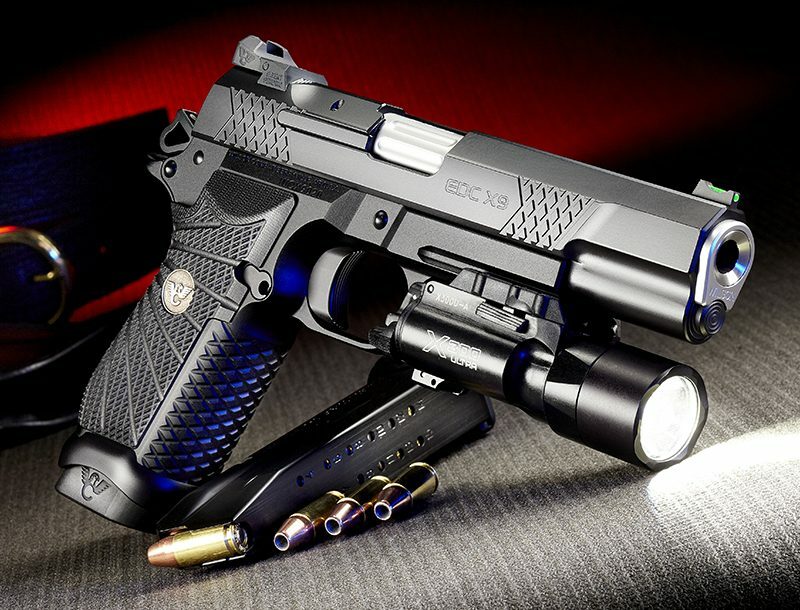 It is slim, short and lightweight with excellent sights, controls and ergonomics—just what you want in a pistol you will use for deep-cover carry. 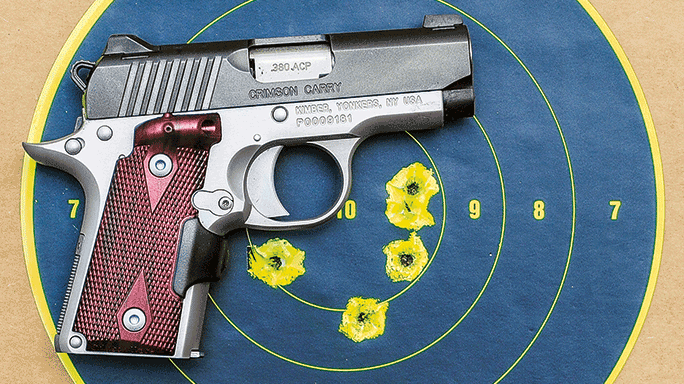 Those who are looking for an ultra-concealable pistol that still fires a respectable cartridge—and who happen to be fans of single-action triggers—will find the Micro Crimson Carry a very attractive little package. For more information, visit kimberamerica.com or call 888-243-4522.